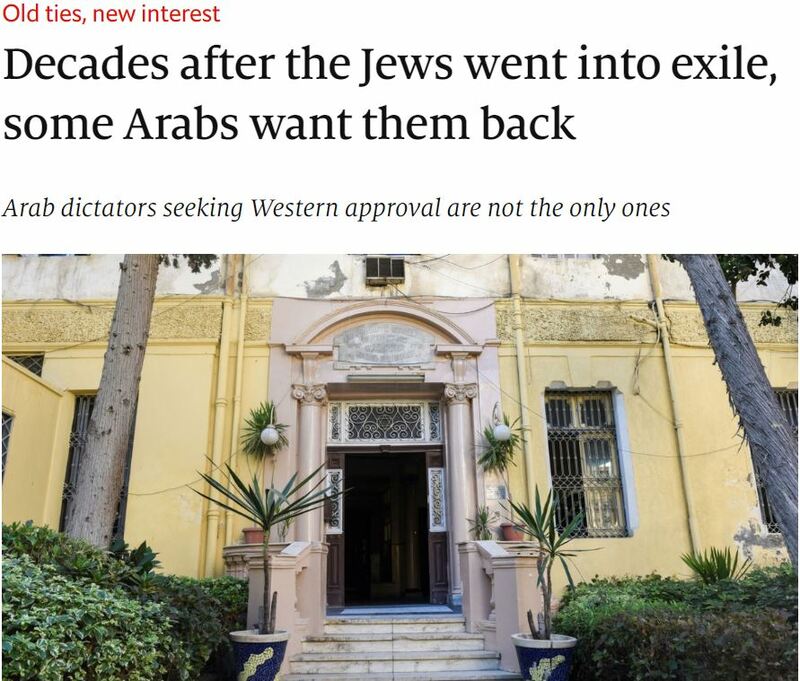 Arab countries that expelled over 850,000 Jews in the decades following World War 2 now want Jews to return, according to an article in The Economist (Decades after the Jews went into exile, some Arabs want them back, April 4). Examples of the Arab-Jewish Spring include a Facebook poll showing some support in Iraq for allowing (non-Israeli) Jews to immigrate, the opening of a new synagogue in Dubai, the Egyptian government’s restoration of a historic synagogue in Alexandria, and the claim by that country’s president that he’d build new synagogues if the Jews returned. Of course, the big word in that vow is the word “if”. It’s easy to be publicly philosemitic when you have no Jews and the prospect of the Jewish community returning is close to zero. Though the article notes that critics view such gestures as publicity stunts by Arab dictators seeking Western approval, the concluding paragraph suggests the Economist journalist buys into the narrative. Of course, the lack of anti-Jewish pogroms may have something to do with the fact that there are very few Jews who still live in these countries! Moreover, the article completely ignores endemic antisemitism in the region – hatred that’s not just whipped up by some politicians. ADL surveys showed that the Middle-East and North Africa has the highest percentage of respondents (73%) who agreed with antisemitic statements such as, “Jews have too much control over global affairs”, “Jews are responsible for most of the world’s wars”, etc. (Palestinians lead the Arab pack with a staggering 93% holding such views.) And, there is no sign that the popularity of such conspiratorial thinking has diminished in the region. Indeed, research published by the University of Chicago in 2018 focusing on attitudes in Egypt in Saudi Arabia showed that 52% believe “Jews carried out the Sept. 11, 2001 attacks” with 68% endorsing some form of Holocaust denial – a figure that’s consistent, the authors noted, with ADL’s survey. Additionally, all you have to do is visit the Arabic monitoring sites MEMRI and Palestinian Media Watch to get a sense of how antisemitism is embedded in the very fabric of daily life on the streets of Cairo, Damascus, Riyadh and Ramallah. Rather than representing any real change in Arab attitudes, the overtures towards Jews by some leaders in the region noted by the Economist can more likely be explained by their desire to curry favour with Israel and the Americans to confront the threat posed by Iran, and likely the belief that a Jew-friendly public face is good for tourism. These fraudulent dictatorships know good and well that no sane person would want to leave a free country like Israel to go back to the lands of Jewish pogroms for … a new synagogue dangling in the midst? If they were serious about changing the status quo, they would finally offer to take in thousands of Palestinians seeking refuge. ME Jews went “into exile”, did they? They just decided one day to up and go, I suppose. It isn’t remotely funny even as a sick joke. So 93% of Palestinians hold ‘antisemitic’ views. Is that at all surprising when they have been occupied by the ‘Jewish State’ for at least half a century and are currently threatened with ever increasing deprivation of territory in the West Bank and periodic invasions of Gaza by overwhelmingly superior armed forces? The largest colonial empire in the world is the Islamofascist empire. They have occupied and colonized most of the land from the Atlantic to Pacific Oceans. Those racist invading bastards have more claim to England than they do Israel. It’s not at surprising that Jews remain steadfast in the face of Arab squatting of Jewish land in the West Bank and the firing of rockets from Gaza into Jewish kindergartens. Not surprising since antistemitism and antisemites have always driven the Palestinian “cause”, Sencar. Why else would you and most other Israeli bashing pundits be here or even interested? Remove the antisemitism and the outsider antisemites and reconciliation, peace and progressive advancement becomes infinitely easier. Blaming Arab resistance to Zionism on antisemitism is like accusing native Americans of being anti-white when they opposed colonisation of their land by Europeans. Yeah, sencar. Jews should simply live in peace with Arabs as dhimmis right? I mean, Muslims have an inspirational track record when it comes to religious minorities amongst them. Right? What you reckon? Gaza as a model of co-existance? Or maybe Iran? Or how about Somalia? Oh sure, the ancestors of blond blue-eyed Americans have been saying “next year in L.A.” for the past two thousand years. And they have recently discovered archaeological evidence of the ancient Roman temple in Peoria. The whole idea of a right to return to ‘ancestral homelands’ for any group is laughable nonsense. People live where they live. Others move in, often by force, and the first are displaced. That’s exactly what Zionists have done to Palestinian Arabs, and what happened to the Jews all those years ago. In the short term there may be a moral claim to reverse the takeover. Long term the world just moves on. It’s the law of the jungle, I’m afraid, and the Zionists were just a late example of European colonialism. That assumes the false premise that Palestinians are the original inhabitants of the land which they aren’t. There’s a reason that the name “Masri” (Egyptian) is so common among Palestinians. Furthermore, you don’t get to dictate where people live. You completely misunderstand my point, Michael. No people were the ‘original inhabitants of the land’ except those that moved from Africa millennia ago. Occupiers since then have come and gone, including at various times the Jews. The idea that they have any special claim, other than from force of arms, is just silly. In terms of recent history it is certainly true that Palestinian Arabs were displaced by (mainly) European colonialists of Jewish origin. The Torah may not matter to you. That’s your business. However, it does matter to others. Well Michael, once you start appealing to the word of God the time for rational debate has ceased……. That is your own totalitarian attitude i.e., you don’t believe it and therefore no one should. Well, Sencar, since land “ownership is so fluid in your opinion, then there is nothing at all wrong with Jews moving to Israel and palis be moved to anyplace else. After all, history is not at all important, in your opinion. Sencar, it is you who completely misunderstand the point. The Zionist ethos has been co-existence. The Pal-Arab – extermination. It is quite natural and understandable that Jews would resist. The Arab Nakba boils down to multiple failed Arab attempt to commit ethnocide on Jews. What is not understandable to you is that largely we do not hate or seek revenge. For you this isn’t “normal”. However the real point I was making refer to the reasons that you are here. You’ve lost nothing. You contribute nothing but negative taunting remarks. You’re purpose appears to be simply to harass people. Left alone Israeli-Arab differences would have smoothed over by now, as they have in other conflicts. Even the conflict in Kashmir does not attract the high number of outsiders like yourself. You delight in fanning the flames. Your involvement has no legitimacy.. If you look into the ethnic cleansing of Jews and other non Arab/ non-Muslim minorities ( Armenians, Kurds, Greek Orthodox, Assyrians, Yesidi etc ) since “for ever” , you will see how the Muslims in effect demasculated and economically decapitated themselves. Nassar cleansed Egypt of its Jews and Greeks thereby sending his nation into a tail spin from which it never recovered. The ethnic and religious mono-culture which Muslims enforce are not good for anything. It is fascist. For further reading I suggest the Arab Human Development Report or this podcast with Benny Morris on Armenia’s 30-Year Genocide.